Please read the following then contact us with details about what you need help with (the type of writing, topic, word-count, and any specific need date). Basic editing can be found elsewhere for as little as $0.015 per word. We do not compete at that level and offer something — what we consider the essentials — needed and affordable to the client at an acceptable rate to us. What we offer includes Grammar and Punctuation (the basics), Contextual Spelling (needed for jargon or unique wording specific to a profession or industry) and limited rework (tightening) of Sentence Structure, Style, and Vocabulary Enhancement. All editing requires scheduling in advance (minimum ten business-days for short-form). Expedited service might be available–depends on how fast and current workload–but with a surcharge. Please advise timing and need at the time of your request. Enhanced Editing Fiction and Standard (Straight) Nonfiction @ $0.12 per word: Grammar, Punctuation, Contextual Spelling, Rework, Re-write (as needed) and Improvement of Sentence Structure, Style, and Vocabulary Enhancement. Breakdown the original draft, identifying areas to revise, re-write, re-sequence as needed to improve. Look at word choices, sentence structure and to vary phrasing; editing to improve the narrative. Make the story tighter and leaner, eliminating as much passive voice as possible. 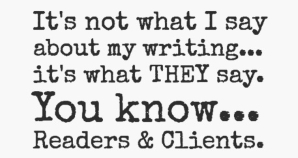 Remove soft wording and phrasing that creates padding leading to a sense of ‘overwriting’ or bloated writing. Re-aligning content as and if determined it’s needed to improve the story and narrative flow. Identify and discuss any story and content weakness or voids with the client and determine resolution, next steps and action to take. Services are usually completed in two passes (stages) through the source content, to create a revised and improved manuscript. Depending on size and complexity, multiple iterations in collaboration with the client may be required. Contact us with details about what you need help with (the type of writing, topic, word-count, and any specific need date).